Art Trophies - Our artists trophies come with Free Engraving and fast delivery! Do you know a truly creative individual with a passion for art? Whether you know someone who deserves an award for their work or you want to congratulate a friend or family member for graduating with an art degree - we’ve got you covered! We’ve been supplying schools, colleges and universities with medals and trophies for over 30 years, in which time we’ve built up a strong reputation for being one of the leading trophy suppliers in the UK. We are proud to have high-quality products with the most exceptional prices on the market to guarantee you find what you are looking for at the best possible price. With our wide range of art trophies available, there is something for everyone. If you can’t find exactly what you are looking for, contact us and we will do our best to find it for you. From our large art award and V series artist trophy to our mini stars art award and art mini shield award, you will definitely find something suitable. At Aford Awards, we are proud to have an unrivalled customer service who are on hand at all times to provide their expertise. With our years of experience in providing the education sector with trophies, awards and medals, we are proud to have secured happy clients that return time and time again. Each one of our art trophies and awards are made from the highest quality materials to withstand the test of time and stand proud in the trophy cabinet for years to come. We are so sure to offer our customers the best prices on the market that with our price promise, we guarantee if you find the exact same product at a better price elsewhere, we will not only match the price - we will beat it by 5% to ensure a happy customer. Customer service is our main priority therefore we love to gain loyal clients who would love to recommend us to a friend. If you need more than one art trophy, fear not, we can offer a reduced price for bulk buy purchases when added to the basket. Our art trophies come complete with a complimentary plaque on the front of each design creating the perfect space for engraving. 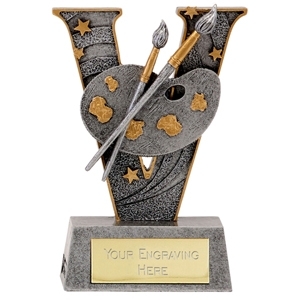 With each art trophy purchased, we provide our free engraving service allowing you to get as creative as you can in the 60 character limitation. And it doesn’t just stop there - if you’ve found the perfect gift for a loved one and want to add a special touch, we will engrave it for you with our exclusive premium engraving service. From jewellery and watches to stationary and tableware, if there is space to do so, we will engrave it with our state-of-the-art engraving machinery. If we can’t personalise it, it’s not worth personalising! Contact us today to speak to one of our friendly advisors and discuss all you need to know about our art trophies or our engraving service. Of course, the arts can also extend to the likes of music and singing and we’ve got you covered! Take a look at our music trophies and singing trophies for more inspiration and if you still can’t find what you are looking for call us on 01622 738711. We’d love to hear from you!